Royal Caribbean's Quantum of the Seas cruise ship offers tablets, robot bartenders. 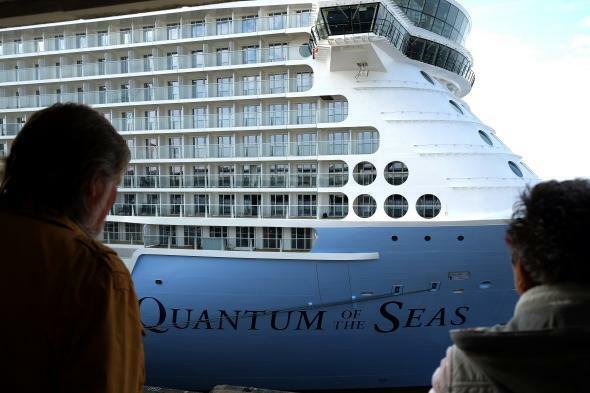 Visitors attempt to quanitfy the Quantum of the Seas cruise ship. After norovirus scares and the unfortunately dubbed “poop-cruise,” one company has figured out a way to remove at least some small portion of risk from the floating petri dish that is a cruise ship. You can’t get rid of the disease-ridden passengers, of course, but you can replace your bartenders with an army of robots. Having arrived into its New Jersey home port on Monday, Quantum of the Seas, Royal Caribbean’s latest cruise ship—or smartship, rather—is stacked with all the gadgets you could want while chugging from Port Canaveral to the Bahamas. Accommodating 4,180 guests, with 1,500 (human) crew members, the thing is huge and full of high-tech luxuries that make you say “WOW,” or so Royal Caribbean hopes. These include making restaurant bookings on tablets and trackable bags with RFID luggage tags. Not to mention a skydiving simulator, bumper cars, and super-fast Wi-Fi. Truthfully, locking yourself in your cabin and indulging in hours of uninterrupted episodes of Sherlock might be the best choice you could make on the high seas, if David Foster Wallace’s infamous account of his lobster- and shame-filled ride aboard the ship Nadir are anything to go by. Judging by the sheer number of screens in the Quantum’s promotional video, it seems no one would even notice if the ship ever left port. There are screens everywhere in the vacation of the future, lining the hallways and in the bar. Tablets are liberally scattered about, and guys talk on their smartphones while tapping on their laptops at the same time, presumably with a great connection because of that super-fast Wi-Fi. This new venture is part of an attempt to refresh cruising’s image and appeal to younger people, Royal Caribbean President Adam Goldstein told Bloomberg. The more things change, the more they stay the same, though. There is a Bon Jovi cover band aboard the Quantum. That’s about as lo-fi as it gets.